Arkwright Insurance can provide motor trade business owners with a suitable, tailor-made insurance policy that covers all the necessary aspects of your business at a competitive cost. Motor trade insurance refers to a wide range of possible policies that can be combined to provide suitable cover for businesses working with cars, vans and other vehicles. Since this type of insurance can cover different business taking many different approaches to the motor industry, policies are often tailored specifically on an individual basis. Whether you're selling vehicles, repairing and replacing parts or driving a customer's car as a valet, having the appropriate insurance in place will give you peace of mind that you're covered in case of any unexpected and potentially expensive problems. Depending on the size of your business, you may require a policy that provides cover for several named drivers or even 'any driver'. Motor trade insurance will generally cover any vehicles your business owns, as well as customers' vehicles that come into your care, custody or control for the purpose of carrying out any necessary work. What does motor trade insurance need to cover? 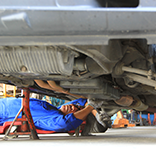 There are lots of different ways in which a motor trade insurance policy can be tailored. It's important to think about and discuss the kinds of regular activities and potential risks that you face in your daily operations. Not only will this prevent you facing a nasty shock if it turns out you're not covered for something, it also ensures you don't end up paying for cover you don't really need. Liability insurance: Like any business, operators will be liable for the safety and wellbeing of people and physical assets. With employer's liability insurance as standard, you protect the business in case of claims made by your employees. Additionally, public liability and product liability provide protection if your work causes damage to a customer or if you provide non-working parts. The level of liability cover you need will ultimately depend on the type of your business. Material damage cover: Working in the motor trade industry, there's a strong chance you'll own a lot of vehicles and specialist equipment. Should any of these possessions suffer any accidental damage, they can be quite costly to repair or replace. Suitable damage cover will ensure that unexpected issues like this won't leave a massive dent in your finances. Road risk: If your business involves you taking vehicles out onto public roads - either to deliver them to buyers or test driving to check any mechanical faults - you may need to seriously consider getting road risk cover. Like standard motor insurance, there are options for Third Party, Third Party Fire & Theft or Comprehensive cover. Additional drivers: When you have multiple employees working with multiple vehicles, it's important to ensure that cover is provided for all those who'll be driving. While it can be cheaper to limit cover to just a few named employees, having a policy that insures 'any driver' may be more useful for your business. Specific vehicle types: Dealing with multiple types of vehicle - like cars, vans, motorbikes and HGVs - your business will require the appropriate cover. This may make your policy more expensive, but will ensure that the types of vehicles vital to your business are insured properly. For companies in the motor trade, it can be a tricky job getting all those insurance needs consolidated into a single comprehensive policy. This is where Arkwright Insurance is committed to helping businesses to find a policy that suits them at competitive but affordable premiums. Thanks to a wide-ranging panel of insurers available, we can provide flexible policies that offer different levels of cover to meet the specific requirements of how your business operates. For further information on some of the different motor trade insurance options available, check out the Specialist Insurance pages below. To get started with finding your ideal motor trade insurance policy, call Arkwright on 01204 392 525 and speak to one of our dedicated team to discuss your requirements. From there, we can produce a tailor-made policy with a competitive quote to suit your business. Cover for your vehicles and your customers' vehicles when used in connection with your trade. Make sure your vehicles are covered whilst out on the road isn't just a top priority, it's legally mandatory. Mandatory cover if you run a garage or dealership to protect your premises and your staff.